The Doom engine is an three dimensional (technically 2.5D) first-person game engine developed by former id Software lead programmer John Carmack for use in the original Doom, which was first released on December 10, 1993. The title was revolutionary for the then nascent first-person shooter genre, earlier defined by id's own Wolfenstein 3D (1992), massively popularizing it to the gaming and wider public. Later shooters for years, including Blood, were often simply referred to as Doom clones. Peter Freese and Nick Newhard particularly stressed the game's influence on Blood, with the latter's control acceleration described as a partial reverse engineering of the former. The underlying Build engine used in Blood was sector based because creator Ken Silverman learned of the technique from a June 1993 phone call with Carmack. The designers stated that they intended BloodBath to honour and surpass the heights of quality seen in Doom deathmatch. 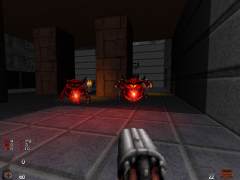 The Doom engine was subsequently used in the sequels Doom II: Hell on Earth (1994) and Doom 64 (1997), as well as third-party games Heretic (1994), Hexen: Beyond Heretic (1995), Strife: Quest for the Sigil (1996), Chex Quest (1996) and Hacx: Twitch 'n Kill (1997). It was also explicitly designed to be easily modifiable thanks to its PWAD system, encouraging custom levels, various mods and full on total conversions. 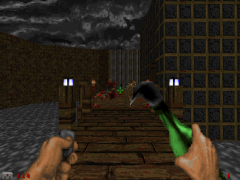 Many of the level designers hired to work on Blood were from the Doom level making community, such as James Wilson III, John Anderson and Terry Hamel. id later released the source code to the engine on December 23, 1997, first under the restrictive Doom Source License and later under the free software GNU General Public License on October 3, 1999. This allowed for the creation of innumerable source ports, brining the game to various modern operating systems and adding in new features such as jumping, mouselook and more. The source code for most of the other games based on the engine followed over time. Similar campaigns for the release of the Blood source code unfortunately failed, but source code for the Build engine itself and separately fellow titles Duke Nukem 3D (1996) and Shadow Warrior (1997) did come out. The Doom engine was then later used in the fan made Blood game entitled Blood TC first released in 2006, as a total conversion for Doom II. 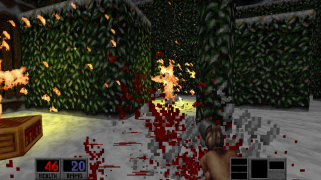 A Blood Resource Pack was also earlier compiled as a texture WAD file allowing for the Doom engine to use Blood textures. It was created by Daniel "Tormentor667" Gimmer, who used it in his popular "The City of the Damned" map. Later maps by other authors such as "Infuscomus" and "Miskatonic Trip" carried over from this. ZDoom is a modified version of the Doom engine made to include Build and Quake engine like effects. The Blood TC project switched to ZDoom and started the ZBlood effort because ZDoom is a lot closer to the Build engine used in Blood in terms of features. ZBlood can be used by all ZDoom compatible Doom source ports, most notably the modern GZDoom. The undertaking has also spawned numerous forks over the years, most notably and recently ZBloody Hell. ZDoom itself is also able to be ran with the Blood executable, which puts the BloodBath announcer known as The Voice into Doom. ZDoom can also limitedly run Blood maps and art files using the same method, but a lot of the Build specific effects do not work. EDGE, another engine based on the Doom engine, is being used to create HYPERTENSION, a pseudo spiritual successor to Blood. Because of its large community and easy modding support, the engine and its modern derivatives have become popular for Blood projects that require modifications to the base gameplay or the expansive addition of new assets not properly possible with the original Blood executable. Examples include Caleb Versus Nazis, Blood: Dead on Arrival, and other projects listed below such as Ultra Crispy. This helps fill in a gap that was acknowledged by the Blood developers as one of the greatest drawbacks of their game; though this is to be soon up against the scripting abilities of the Kex Engine once the Blood Remaster is out. The Blood Prequel was a project by Ermi to create an open world shooter game set before the events of the original Blood using the ZDoom engine. It mostly features Caleb meeting Ophelia in her burnt out homestead in 1871, earning the initial ire of the Cabal. Released unfinished on January 23, 2015. Some of its more notable features included a dialogue and currency system. Horror 3D was a project started on March 15, 2015 by Trevor "0402" James, which aimed to recreate the look and feel of Blood in its original "Horror3D" incarnation. This mostly involved using assets and ideas from the Blood Alpha. The effort was declared discontinued on May 31, 2017. "Let's set our minds back to 1871. We all know the sad fate of the undead cowboy known as Caleb, main character of the Blood series and his thirst for vengeance, as he was betrayed by the dark god known as Tchernobog. When he (Tchernobog) killed the Chosen, and among them, Caleb's beloved Ophelia, he knew Caleb would seek revenge more powerful than ever, many years later. But what if Tchernobog used his powers to banish Caleb once and for all from that dimension? Caleb awakes in the middle of a demonic invasion on earth. But not that world he used to know. Things look too different. It's up to you to find some answers. Or maybe, you could wake up on a Dark-fantasy themed scenario, or even, a dystopic cyberpunk themed world! The possibilities are on your hands." Ultra Crispy is a ZDoom mod based on the premise of Tchernobog banishing Caleb to alternative dimensions, namely IWADs such as Doom II, Heretic, Hacx or Freedoom, as well as PWADs and other mods for those games. It features custom weapons and the prominent inclusion of Caleb, but aims at broad compatibility with Doom engine games. Maintained by GAA1992 and first announced on May 16, 2018. "Blood Rebirth that a expanded version of original Blood. Which includes remakes of original maps, new weapons, new enemies, more blood and lots of other new futures! But project still in super early stages of development. So, don't be so excited about that project and keep in mind that only two of us, me and my friend working on that project. And we have own problems like study and other stuff. Please be patience, we try to do our best. We plan to make a separate game on GZDoom engine, so you don't need "doom2.wad" or other kind of IWAD's to launch it. You just can use Blood Rebirth as IWAD. Also we want to make NEW maps based on original maps. We want to expand them, add new areas, new secrets, more enemies. What you already can see on screenshots and video below. Also we think about to make own maps, that not included in original game. But this is still in question. About weapons, we are going add to all weapons reload system so they can fells a more realistic. Add new weapons, like revolver what you also can see on the screenshots and video below. New enemies, but i will not tell what enemies. Let's leave it a secret, for now. We also want to remove that "Episodes system", and make full game from start to the end. But there is still choose when you start a game, which episode to play like in original. But you can just start from first episode and play through all campaign without the need to choose another episode." A project to create an expanded experience from the original Blood, with remade maps, levels, enemies and more. "A single-player campaign in the Universe of BLOOD. It reveals Caleb's history after the events of the game released by GT Interactive in 1997. This project is based on original assets. But it applies all modern graphic technologies which helped the previous project to achieve such success. In BLOOD: The Curse Hunter I'm doing my best to stick to the authentic gloomy bloody atmosphere of black humor and cruelty. Another goal is to focus on designing an alloy of classical and modern game mechanics. I’m trying to make the world of BLOOD more alive, interactive and interesting. At the same time avoiding wave-based gameplay. BLOOD: The Curse Hunter plot is based on the most ancient mythological texts, written in dead languages. However it was tailored not to contradict both original games plot and their addons." A pseudo-sequel to Blood by Bifurcator being built on GZDoom that aims to add more modern as well as simply new gameplay mechanics while still retaining the game's classic feel. A demo was released on April 5, 2019 on Pateron, with a later release planned for ModDB. The following are either Blood content or modified Blood content converted to the Doom engine palette. Feel free to add more. SlapTheFish's Treasure Chest of Crap! This page was last edited on 13 April 2019, at 21:18.